Bungie's Marcus Lehto was grinning like a proud papa when we had a chance to chat with him during X10. The Halo: Reach creative director had been demoing his baby continually for around eight hours, but seemed excited just to be able to tell us more about the studio's final Halo game, his presentation of which had totally wowed us earlier in the day. We reached out, shook his hand, said Halo (okay, not really) and got cracking with our questions. 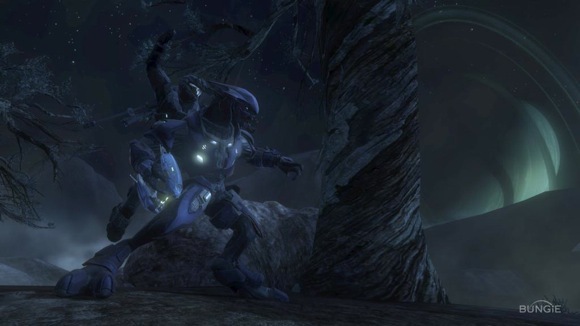 Joystiq: As a game that is intended to cap off Bungie's work on the Halo series, how do you end a story by going back to the beginning? Marcus Lehto: What we wanted to do is kind of bring everything full circle. Going back -- to a prequel -- to delve into the stories of the Spartans on planet Reach and to tell their stories; What they did, what they did that transpired and led to the events of Halo 1, was such a cool thing for us to tackle. That's the thing that really got us excited about [Halo: Reach]. We came up with an amazing story tell tell. For us, like I said, it does literally bring things full circle for us because we're doing things in Reach -- and telling this story -- that really help us encapsulate the entire series and make sense of everything. And it's a special treat that it happens to be -- by far -- the best-looking game in the series? (laughs) Well, with every title, they of course get better-looking. Yeah, the characters from Halo 1 all the way to Reach? Yeah, absolutely. Why not just "Halo 4"? Why not end it with telling us what happens to the Master Chief? To us, when we looked at that issue, Halo 4 wasn't as much as a stand-alone type game. When we really started asking the questions about where we would take that story, there was too much to it. There's too much to add to a single "one off" game. What we got a lot more interested in, then, as a result, was going back to the time just before the Master Chief and Cortana. To the time on the planet Reach, where -- at that point -- now we have this encapsulated, really cool and very rich story that we could tell. Is that going to be a component of Halo: Reach? Can't confirm, nor deny that one! I can say that we do take pretty great pride in what we did with Firefight and, well, we've never been known to leave great features behind. Bungie seems to be okay with the idea of other studios being involved with Halo games (Ensemble Studios developed Halo Wars), but would you be resistant to the idea of another studio creating a game that stars Master Chief? Well, when we were purchased by Microsoft we sold the rights to the Halo franchise. We don't own it. While we have a great relationship with Microsoft -- we've worked with them as a preferred developer of the Halo franchise since we created it, starting back in 1997 -- Microsoft is free to do whatever they want with the franchise. So, we can only hope that whatever comes after we're done with Reach continues to uphold the greatness of this universe. If it was something I created, I wouldn't want to see it go "off the tracks." It's hard. It's our baby that we created but it is definitely taking on a life of its own. Any ideas how Halo: Reach will interact with Halo Waypoint, as of now? I can't speak to that, actually. I'm sorry. That's all on Microsoft's side of things. But that is a good question. You're here showing Reach -- and you've got work to do on it and you're very deeply involved in the game -- but Bungie has been known and associated with Halo for so long. Are the gears in motion to do something new, something as iconic as Halo? Sure, yeah. Before Halo we had the Myth series, the Marathon series. We put a lot of years into those franchises and we did some really amazing things with them. So, we're super excited to delve into a brand new franchise, coming up next. Are you open to any genre at this point? Well we have done RTSs [real-time strategy], FPSs [first-person shooters]. We've done third-person fighting games like Oni. So, I mean, we've definitely got experience with a number of different styles of games and we're really excited about what we're doing next. [The cinematics] are going to be a generational leap forward, with what we've done. Is it a matter of just approaching it differently? Bringing on new people? The jump there does seem substantial. But in a lot of ways you think, "Wow, this is the same console that Halo 3 was on?" Yeah. It's the same hardware! It's not getting any better on that side of things, so we have to improve what we're doing with the code and our engine. In regards to the cinematics and the way our characters are performing, that was something I really insisted upon. When we went in on this project, I said "Listen, guys, we've done a really good job with gameplay. What I don't think we've done a great job with in the past is animation and the way our characters perform in cinematics." I said, "I think it's time for us to take a very hard look at a clean slate approach." So we did. We actually, nearly gutted the entire animation system and rebuilt it up in order to accommodate some of that vision. And it required me standing over the shoulders saying, "Hey, no. That's not good enough. We have to keep moving it forward." Did you get some motion-capture of you doing a whipping motion? (laughs) No. I should have! Halo is a huge multiplayer phenomenon, but you guys also have to be keeping up with what everyone else is doing out there. Are you going to basically stick to what has really worked and not mess with it too much on the multiplayer side? I think it's fair to say that we're taking some pretty big risks on Reach. While we'll still have all of the good stuff that players have come to know and love about Halo, we've made that better and given them new features on top of that. We are really doing some other things. New gameplay features to multiplayer that... Well, yeah. Right now waiting for the beta, coming up on [May 3] to see what the fan's reaction is to some of this is. Some of that will be revealed during the beta? And Halo 3: ODST is the only way to get the beta? There are no plans at the moment to have contests or giveaway codes? ODST is the way in. Editor's note: Interview conducted by Randy Nelson.